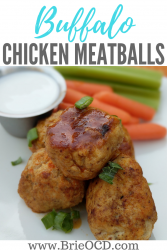 These buffalo chicken meatballs are tender, gluten-free and super easy to make! 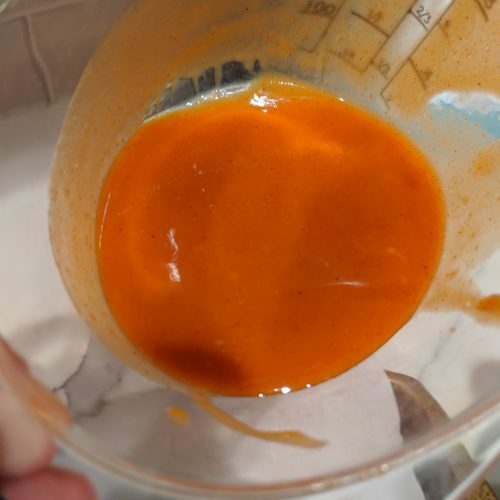 This recipe was adapted from What Great Grandma Ate (click here to view) but the proportions and timing in the Instant Pot just weren’t right. They were too mealy and definitely overcooked. So I bought all the ingredients again and made my own adjustments to the ingredients and also played with the timing …. they turned out perfect! These meatballs are way healthier than your run of the mill meatball. 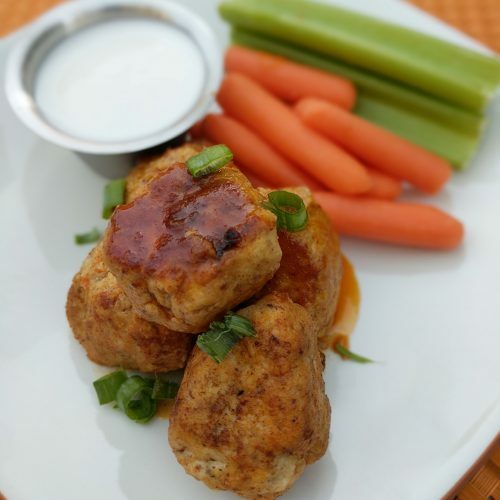 Per 5oz meatball, there are 98 calories, 6g fat, 1g carb and 8g protein. I usually have 4 per serving but you can literally customize to your own dietary/macro needs. Because of the almond meal, these are gluten-free! I buy the Almond meal (pictured below) at Trader Joe’s! I wasn’t sure where to find it but I asked and it was right next to all of the nuts. I buy my calorie and fat free Walden Farms Blue Cheese Dressing at Sprouts or on Amazon (by clicking here) and most recently I saw it at Walmart! 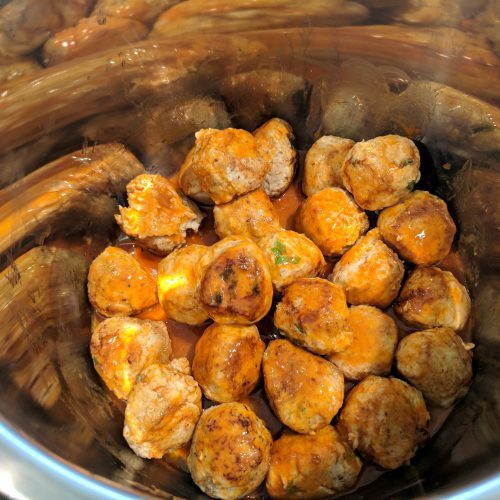 I browned the meatballs on the stove top however you can use the Instant Pot if you don’t want to dirty another pan. I have had issues after sauteing directly in the IP because if you don’t clean out the bottom of the pan completely before switching to pressure cooking the burnt bits cause the machine to malfunction. I rather not even go down that route. If you don’t have an instant pot, follow steps 1-6 below and instead of putting them into the IP, put into a baking dish and bake these in the oven on 400 for 15 minutes. Alternatively you could also cook in the crock-pot. Simply follow steps 1-6 and place in the crock-pot on low for 5 hours. 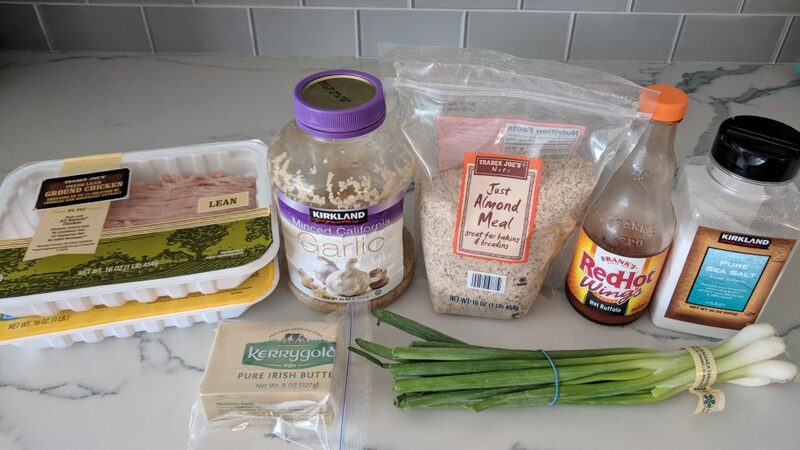 in a large mixing bowl, combine chicken, almond meal, salt, minced garlic and green onions. put a couple tbsp of melted coconut oil in a tiny bowl. over medium high heat, in a large saute pan, heat 2 tbsp of butter and start browning all sides of the meatballs. (depending on the size of your pan you may need to do multiple batches). Transfer to instant pot when done browning. while meatballs are browning, melt remaining 2 tbsp of butter in the microwave or on the stovetop. add in 3/4 cup of hot sauce and stir well. pour buffalo/butter sauce over the meatballs and gently stir so that all meatballs are coated. top with sliced green onions and lite dressing. 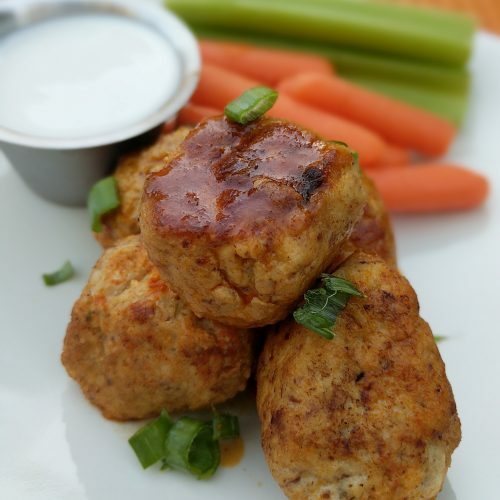 serve with carrots, celery and white rice or cauliflower rice (click here for how to make! )!